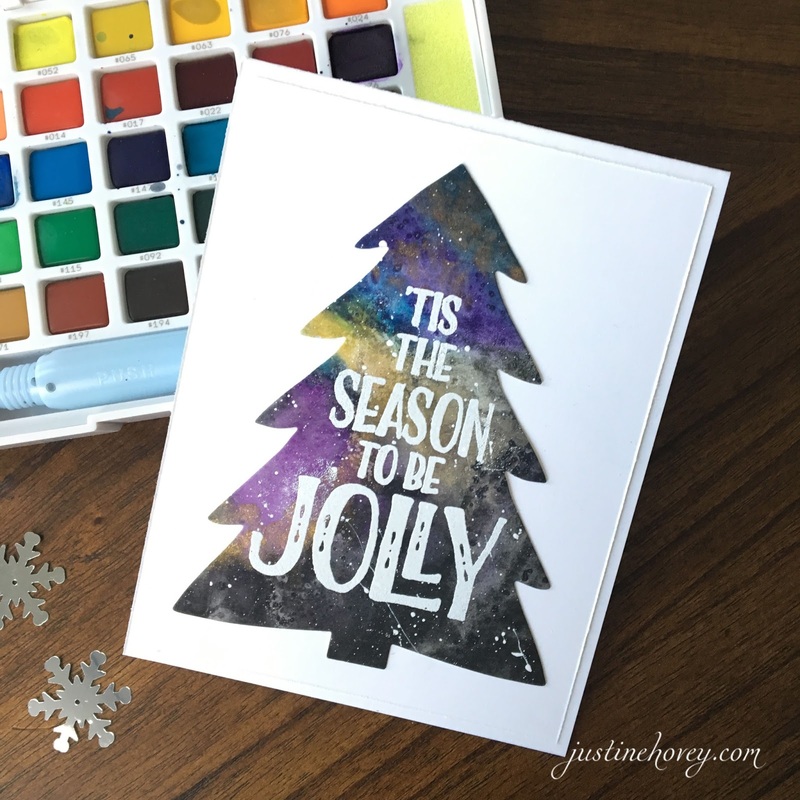 Justine's Cardmaking: 12 Days of Christmas *BONUS* Galaxy Watercolors and Concord & 9th Giveaway! 12 Days of Christmas *BONUS* Galaxy Watercolors and Concord & 9th Giveaway! today is a bonus day of the 12 Days of Christmas series! 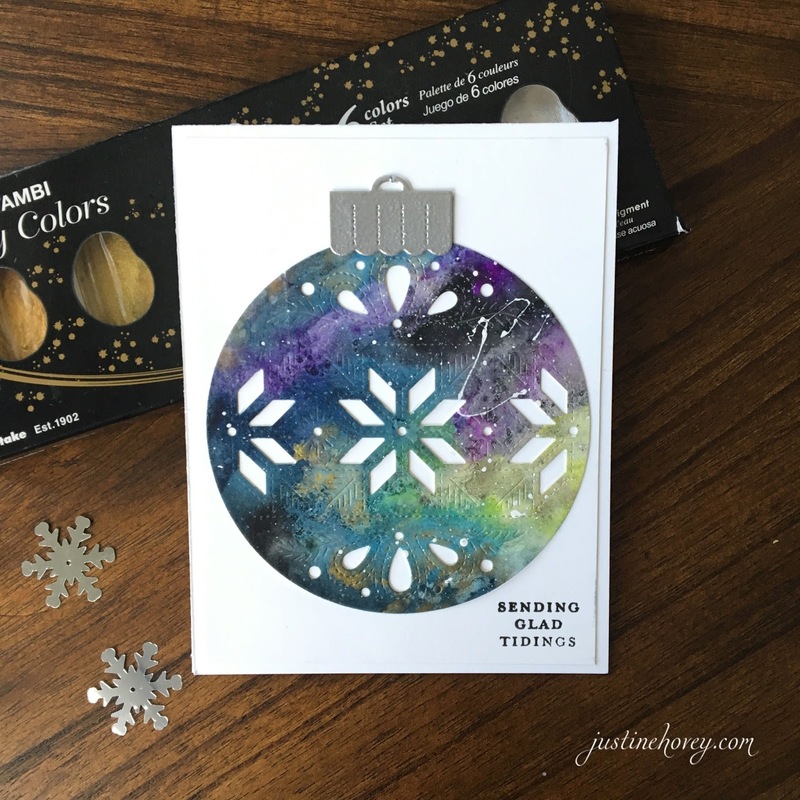 I am so excited to show off a cool galaxy watercolor technique that you can do that results in four or more cards being made! Also it's a great way to use up watercolour background that may have some areas you don't like. I used some products from Concord and 9th! They sent me so much stuff to use for the series that I couldn't justify just doing one video, so here is video #2! I am currently taking Melanie's Cosmic Watercolor class where I was inspired to create this background. I have no affiliation with her, I am just suggesting this great class in case you're looking to try something new. I created all of these cards using the Sakura KOI Watercolours ( SSS | AMZUS ) and Zig Kuretake Gansai Tambi Starry Colors ( SSS | AMZUS )The Ornamental BUNDLE( Cand9 ) is so innovative! You can simply cut out the ornament shape, you can add the middle die to create the pattern shown above AND you can also die cut two different patterns in the top and bottom. It also comes with a coordinating stamp set so you can stamp the inside or emboss to create different looks (so awesome!). For this card, I used the Trim the Tree bundle( Cand9 ) to create a fun galaxy tree! There are many things you can add to the tree as well that come with the stamp set. I love those splotches of paint and how they are not perfect! I think these two are my favourite, what can I say I am a clean and simple gal! The galaxy just pops with so much white in the background. 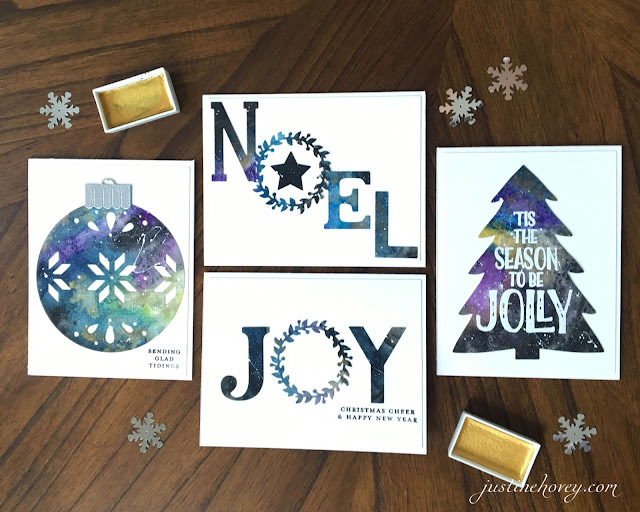 The Joyful Noel bundle( Cand9 ) are some of my favourite, bold Christmas sentiments this season. GIVEAWAY sponsored by my blog! Love your cards! Going to try the galaxy background! These are gorgeous! Have yet to try out a galaxy background! Gonna have to try it out! Love ! Will definitely give this technique a try ! Thank u so much for Your Great videos. Beautiful cards. I am not a water color person, but I love looking at the results. Very pretty! Thanks Justine for sharing! I’ve never tried a watercolor background! Would love to do it now! Gorgeous Galaxy cards! I love your Joy and Noel cards, so clean! While they are all nice and I love 'sets' like this - my favorite is the ball ornament. The background really shows up nicely! 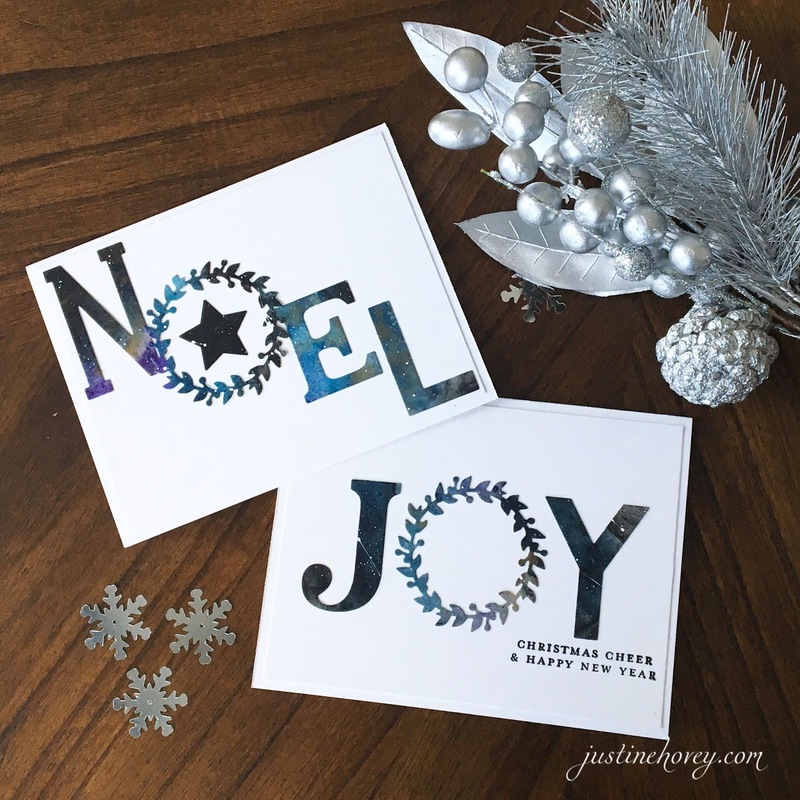 Love your cards Justine and the details on the snowflake die are stunning. Love how these cards turned out!! The ornament card is my favorite!! Justine, The Galaxy watercolor ingredients is beautiful! Thanks for sharing the technique. The cards you made today are simple as you said but very elegant and striking. Concord and 9th has wonderful dies. I have this set and can’t wait to make cards like this! Such beautiful projects! I really love the ornament card, my favorite. Fantastic backgrounds and I love those Concord and 9th sets! Gorgeous cards, love the idea of doing the galaxy background. You make the galaxy background look easy....mine always start as a hot mess and end in a hotter mess! Trying your technique today! Wow... these are so pretty! Love the effect of the galaxy background! Looking forward to watching how you did that! Love the stamps and dies you used! Love the idea of creating a big sheet of galaxy watercoloured paper and then die cutting. Will need to brush up on these skills. Wonderful cards. Your galaxy turned out nice. Can't wait to see your painting when you complete the class. Awesome cards. Having trouble posting a comment. But loved the cards and those dies are great. You are sooo talented. I too, want to learn how to make galaxy backgrounds. You made it look easy, thanks for sharing. Thank you for sharing what you learned. I would love to take the same class although not in my budget. Thank you for sharing what you learned and I love your cards! I have been trying to post a comment but appears my phone doesn't like me today. I wanted to mention I have the same trouble, Norine. I'm going to try using my computer so I can try to copy/paste the information. Norine, If you are doing this from your phone it won't give a URL. From a computer click pin in the raffle-copter app on Justine's post, Then when pinterest asks which board to pin to, pick one, then it will give you a red show me in the lower right corner, click that then it will take you to the page your pin is on. Then you can copy the URL out of the address bar. Hope this helps. What a fun way to add watercolors to cardmaking! The ornament card is my favorite. What a surprise ending! Just lovely. Love these cards, and the Concord and 9th dies are awesome! Such a pretty background. Gorgeous cards. Beautiful galaxy background and such a creative use for them! I have never heard of Galaxy backgrounds before. Learning new techniques every time I visit! Loved the look. Thanks for doing this..enjoying every day! The way you have added color to these cards is phenomenally beautiful!!! And the C&9 products are incredible!!! I think my favorite cards are the NOEL and the JOY! Thanks for sharing your beautiful designs!!! Love your galaxy background was Super Duper background! Thanks for sharing your cards! I just love your style! Thanks for sharing! I really love the unique and innovative products from Concord & 9th. Your projects are beautiful! Love your cards they are gorgeous and a wonderful technique!! Thanks for the inspiration Justine. Would have never thought to use a galaxy background for a Christmas card. But these cards look magical and festive. Perfect for the season! Love all of these cards! I think it is time for me to try making a galaxy background. Thanks for sharing. These are great, seriously Concord & 9th has the best stamps! You make it look so easy to do a galaxy background! Your cards are a great inspiration. I love the Noel and Joy cards. Great galaxy cards! So fun to see the reveal when a galaxy. I wouldn't have thought to use the panel for Christmas. Love the idea. Beautiful cards from the watercolored galaxy technique! I haven’t tried a galaxy background with watercolor, only alcohol inks and distress oxides. Thanks for another awesome video tutorial. LOVE these C&9 products! Justine this is such a genius idea! I would have never have thought to do this with a galaxy background and I am so excited to try it. Your cards are all so beautiful and I cannot wait to try this. Thanks so much for sharing this amazing idea! I enjoyed watching the video and seeing the cards being created! I love your cards and learn so much from your videos. Thanks you for sharing with us! Beautiful cards!! I saw your video and you did a fabulous job explaining what to do to create your galaxy background. I think it turned out just wonderfully! I've done very little watercolouring and am quite hesitant to give it an honest try but after seeing your video I am thinking I could possibly create something I could use - by die cutting it up if I don't like it as a panel. Thanks for the inspiration!! The galaxy trend is pretty fun. I love how yours turned out. Do you think the recipients of our cards will know it is supposed to be a galaxy? Not sure if mine look quite good enough. LOL Thanks for the video and the link to the class. I love doing galaxy cards and yours is super fun! I've never done a galaxy background. It intimidates me a little.... I think I'll give it a try now though. Thanks! Love those galaxy cards. Cand9 have beautiful stamps and dies. Definitely giving this galaxy background a try for myself. Awesome cards. I really love the way these turned out. I'm not much of a watercolor painter but I think this is something I can actually manage. I love galaxy backgrounds!!! Never would have thought to use as Christmas cards!! Love it!! Beautiful cards! Love the galaxy background! When you began, I thought what a hot mess this might be. I was soooooo wrong. The galaxy painting turned out fab! I'm going to give this a go. I loved what you did with it. The cards were awesome. The galaxy theme is so appropriate for Christmas. Love the ideas and the stamp and die cut sets are perfect. This is so pretty. Water coloring is one of those things that just intimidates me. You made it look so easy. I'm just going to have to try it. You made the galaxy background look easy enough that I ought to be able to create one! Love all the dies cut out of it, that helps if it's not "perfect". Concord and 9th always has great products and you made them shine. Enjoying your Christmas series and a bonus video is just that, a bonus! I love your watercolor galaxy background! Love how they look in your Christmas cards! Love to see Concord and 9th products used in such creative ways! Haven't tried the galaxy background yet but plan on it soon. Love your gorgeous cards, especially the Noel & Joy! I love concord and 9th. This was the best release ever! Your cards are just beautiful!!!! I think these cards are fabulous! I love the joy and Noel cards! Super way to use up my watercolor backgrounds! Never would’ve thought to use a galaxy background this way! Very cool cards! Beautiful cards. Love the galaxy backgrounds. Thanks for sharing and inspriting us. Justine, I love this galaxy tree. Thank you for sharing. I love all these beautiful galaxy cards but my favorite is that big ornament! galaxy background looks great! love the idea of die cutting from the galaxy. I love to watercolor but have not done too many galaxy backgrounds either. Thanks for sharing this. That watercolor galaxy technique outs awesome, I need to brave the watercolor galaxy background. I love the bonus video. Thank you so much for your 12 Days of Christmas! I've already learned several things. Such gorgeous cards! I love the addition of purple to those galaxies. Makes for a nice, non traditional, Christmas palette. I'll definitely have to try this myself!! Your cards are adorable. I love the galaxy backgrounds. I really , really like your cards. I love the background that you made for your beautiful cards!!! I haven't tried a galaxy yet, but love to play with watercolor. You just gave me another boost in that direction! And I like the idea of just playing, then using what you paint in small doses with die cutting. I did pop over to facebook, but on my son's account (he signed in on my computer!). I don't mind an occasional peek, but I had to get off because it was such a time sucker for me!! Thanks so much. I am enjoying this series. Catching up this morning after two days with grandkids. Too pooped to get off the chair, so it all works out :-)). Gorgeous! You make it look easy! Absolutely love these! The galaxy theme helps create a more modern design. I just love how your galaxy background turned out! And love the cards - I think I like the ornament one the best. what a great clean and simple card with a twist! Thanks for sharing this technique. Beautiful galaxy background and gorgeous cards! Thanks so much for another great video, Justine! Thanks for the bonus video. I have been very hesitant to do a galaxy background as I'm not a very good watercolorer and I don't want waste supplies if it doesn't turn out. I'll have to come out of my box to try!! Great cards Justine, I must try a galaxy background! thanks for the chance to win! I was having some weekend withdrawal from your series, so THANK YOU for including a bonus video to get us through until you resume on Monday *grin* Your galaxy background is so lovely and using it with C0 products elevates it to gorgeous! WOW! Need to give this a try! I really enjoyed watching you do the galaxy background. I’ve experimented with that a couple times, but you gave some really good ideas, which I will definitely try. Concord and 9th rocked it with this winter release! I *love* that ornament!!! So many ways to use it and I love what you did with it. I never would have thought to do that! So, so pretty!!! Beautiful cards! I love the galaxy backgrounds but have never tried them. I rarely use watercolor in my backgrounds but should start! I haven't tried my own galaxy backgrounds yet, but I know I'm going to soon, because they are GORGEOUS! the tree and the ornament are fantastic. Wow - these are awesome cards. I am definitely going to try this watercolor background technique! Beautiful watercolour background thank you for sharing. I also love to see more ideas for the ornament set I would really like to purchase, thanks for sharing! I LOVE these cards!! Such an easy card to make too!! Also I love to watercolor; I just don't do it a whole lot. Thank you for doing this Christmas card series!!! It actually gets me in the mood to start making Christmas cards. Love the bonus video. I am going to give this galaxy watercoloring a try! I have tried galaxy backgrounds but I wouldn't have thought to use them for Christmas cards. Thanks for sharing. Justine, you should be teaching the galaxy class. These cards are beautiful! I would have to try this out; I haven't attempted a galaxy watercolor background (Or galaxy anything, for that matter! ), but I will have to try this out! Love the galaxy watercolor backgrounds. My favorite is the ornament. Thanks for the inspiration! Justine, I know I have said this before, but WOW!!! I cannot thank you enough for sharing all of your amazing creations with us!!! You are such a beautiful inspiration! May you and your family have a blessed, happy and safe holiday season! Tight crafty hugs!!! I am inspired to give this technique a try! Thank you. I love watercolor though I'm not very confident of my skills. Love the use in the holidays. Thanks so much for sharing with us what you are learning. Love this technique! It is so pretty and no two backgrounds will be the same. This makes for very nice individual pieces of art. I would love these two stamps to start making my own cards. Wow! I'm in love for your stunning backgrounds! Your cards are really magical!!! Wow, the galaxy backgrounds look great, and they're so lovely with the dies you used! Fantastic idea, thanks for sharing! your galaxy backgrounds are stunning! I haven't tried watercoloring yet and you make it look very easy. The galaxy backgroinds turned out great! Just found your channel - subscribed! Thanks hir the ideas- I love being able to "repurpose" ideas and get even more use out of dies! Such a great idea. I love galaxy backgrounds by haven't created too many of them, but now I'm inspired to try something new. Oh wow! The Ornamental Bundle is my fav! I went to Concord's website and they have even more ideas for this gorgeous set! Love Love Love!!! Thank you for the easy galazy technique, I can't wait to try it. whoo hoo.. I love the galaxy background. It's beautiful. Great job! I love how your background turned out! I like to switch between watercolor galaxies and using blender tools with distress ink for galaxies. I definitely find the latter to be easier! Love how you used this galaxy background for Christmas cards. Love this idea, I'm going to try it out! The galaxy background looks amazing! This is actually the first card I have seen from you, I just happened upon your YouTube video while looking at other card videos from my usual subscriptions. I'm glad I found you, I'll definitely be watching your other videos!!! Love these cards!! I have to give that technique a try. I have watercolors, but they kind of scare me! I am not a painter, but watercolors really interest me. What a great way to incorporate painting without the stress of perfection! You're so brave, to do a technique while you're in the middle of taking the class! And it turned out so well! I think the white spattering adds a terrific touch. Thanks! Thank you for inspiring me to incorporate Galaxy backgrounds in my Holiday cardmaking! I've not attempted a galaxy - - but I have created a lg watercolor sheet (with fall leave colors) and used in several cards. Great inspiration. Gorgeous cards! Love the colors and layouts!! I just got some of these stamp sets and now I'm super pumped to use them! These are fun and I'll have to give that galaxy background a try. Thanks for sharing with us! Justine I love this galaxy background technique!!!! So magical! Thank you so much for sharing! :) Christmas projects are my favorite! I have not tried a galaxy background yet. I've been very intimidated. You made it look so easy though. And the white paint streaks - how about shooting stars??? That's part of the galaxy. I’m going to try this, with a Christmas tree die I have, love it. I have done the Galaxy background once and it's so fun and easy. I like the brighter colors you used. Mine wasn't that vivid, can't wait to do one again.Way to think outside the box and use it as a Christmas background! Beautiful idea. Beautiful background! I will have to take this class. I would never thought of using a galaxy background for Christmas cards - this is such a great idea. Galaxy backgrounds are so fun. Love how you made so many cards with one background. New technique for this season!!! Astounding! I would have never thought of using a galaxy background for dies on Christmas cards!, but these are just astonishingly beautiful! Love them! Love the cards you made by die cutting this awesome galaxy background. Great cards, I've never tried a galaxy background before but now I want to take out my paints and start playing. I love the galaxy paper you made. You inspire me and I'm going to try it this weekend. Your galaxy backgrounds are gorgeous. I really want to try creating some. These turned out so pretty! What a great way to use a big background piece.... That saves so much time! So pretty, never thought to use galaxy backgrounds for Christmas thanks for the inspiration! Love these cards and the watercoloring so fun. Love the idea of die cutting them out too! What a fun card, lovely backgrounds. ❤️ ❤️ ❤️ the galaxy look! Elegant and timeless! TFS! I never would have thought to use a galaxy background for Christmas. I love it! Concord & 9th is one of my favorite companies because they have such unique dies & stamps. I would love to win something from them.